To see your families, edit them or create a new family go to Settings/Families. #How to create a family? Families are used to gather attributes that are common to several products. The completeness of your products is also defined at the family level. Your new family is now created. 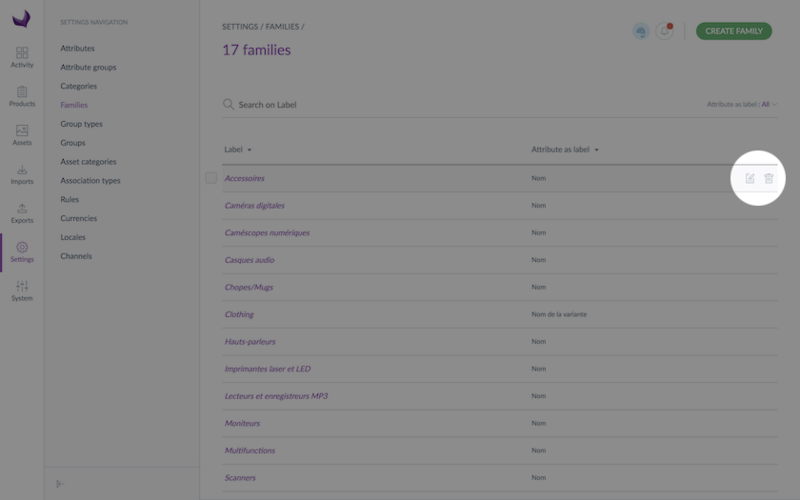 The family's Properties tab is displayed. Set an attribute used as label (required): a text or identifier attribute that will be used as the default name for products belonging to this family. 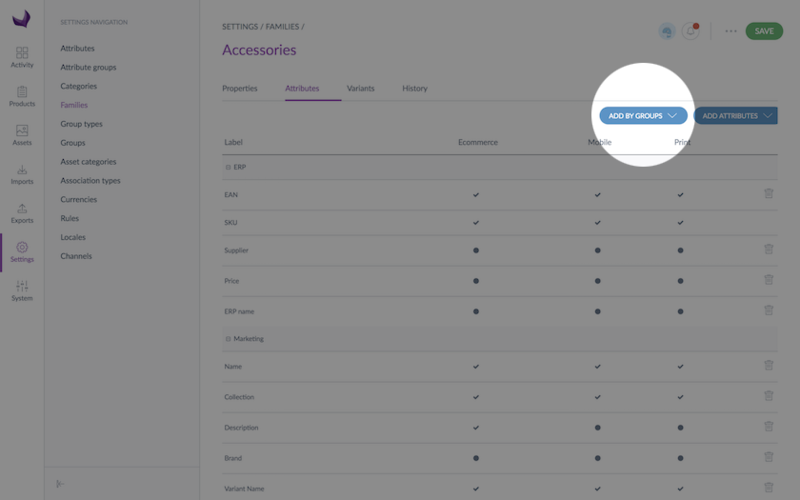 The attribute selected as label will appear in the product grid (as the "Label" column) and in the product form's header. Set an attribute used as the main picture: an image or assets collection attribute that will be used as "the main picture" for products belonging to this family. This attribute used as main image will be displayed in the product grid (as the "image" column) and in the product form's header. 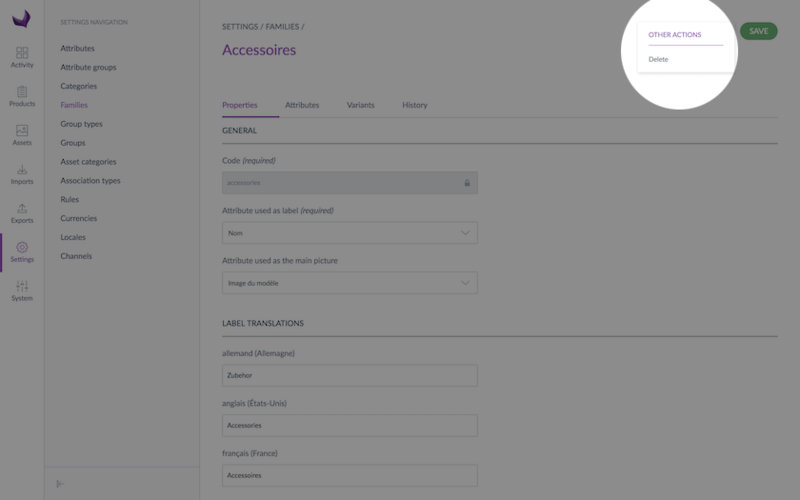 Localizable and/or scopable attributes cannot be used as main product pictures. Translate the family's label with Labels translations: allow you to translate your family name into the locales enabled in the PIM. These information can be edited afterwards. Supported extensions for thumbnails for image or assets collection attributes are the following: jpg, jpeg, png and gif. You must be granted a specific role permission to be able to create a family. Please refer to Manage your user roles. Attributes can be used in one or several families, but an attribute can only be added once to a family. 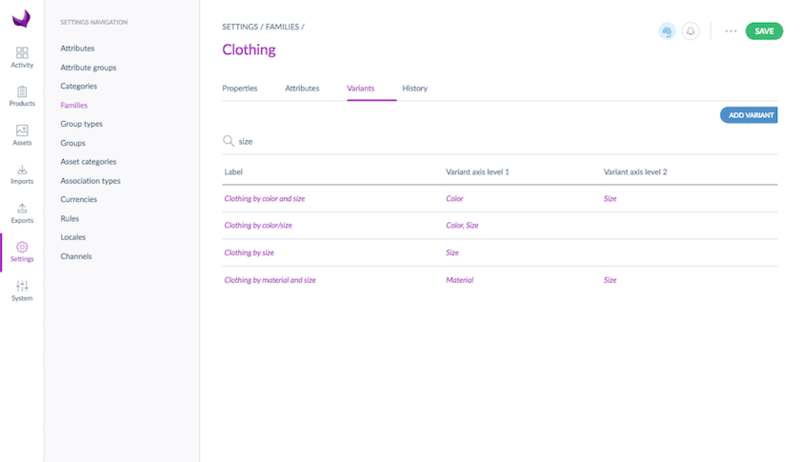 You can easily add attributes to or remove them from a family using the user interface or through imports. Select the attribute groups to add by clicking on their labels and click on Add and then Save. The attributes will be added to the current family. 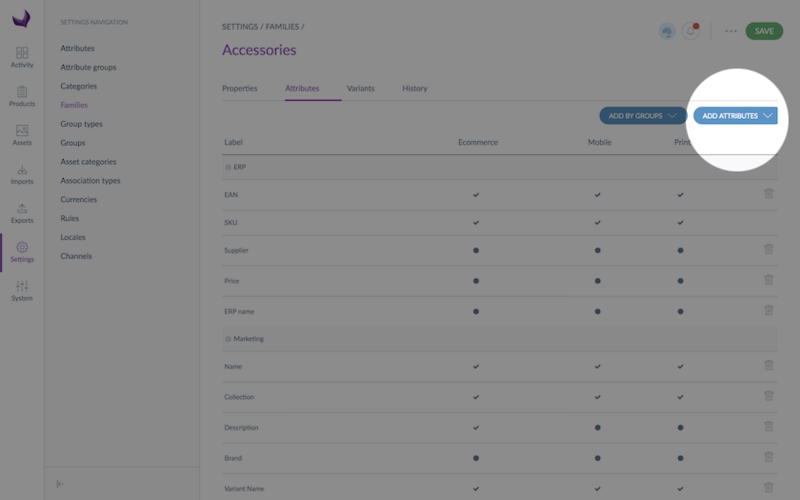 If you do not see the Add Attributes or Add by groups button, it might be because you do not have the relevant rights. Please refer to Manage your user roles. The attribute(s) will be back under the Add attributes list. If you need it later, you will be able to add it again. The completeness represents the percentage of completion of a product, it is displayed as a progress bar or as a percentage in the PIM. It is calculated for each product and for each channel/locale combination. A product is considered as complete (or 100% completeness) when its required attributes (defined at the family level) have values. For more details about the completeness, please refer to Understand product completeness. When an attribute is added to a family, it is not set as required for any channel by default. Only your product identifier attribute is automatically added and set as required for all families. Once changes are saved, the PIM will automatically run a completeness calculation to update your product information. Save time by using the Family Mass action (available from the families grid)! 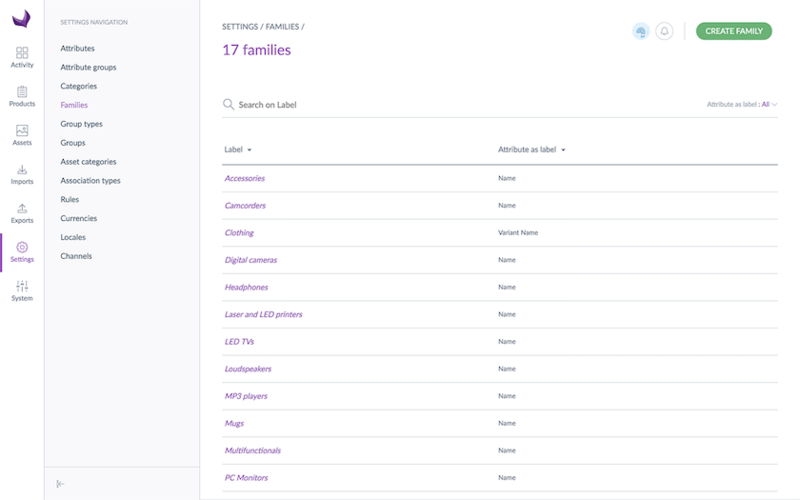 You will be be able to add one or several attributes (or attribute groups) to a selection of families, and also manage their completeness at the same time, read our section Mass edit your families available below. Like for products you can mass edit families and add several attributes at once for several families, and through the same action define if they are required or not for the selected channels. The attributes have been added to the families. Changes made on a family are recorded and visible under the History tab. 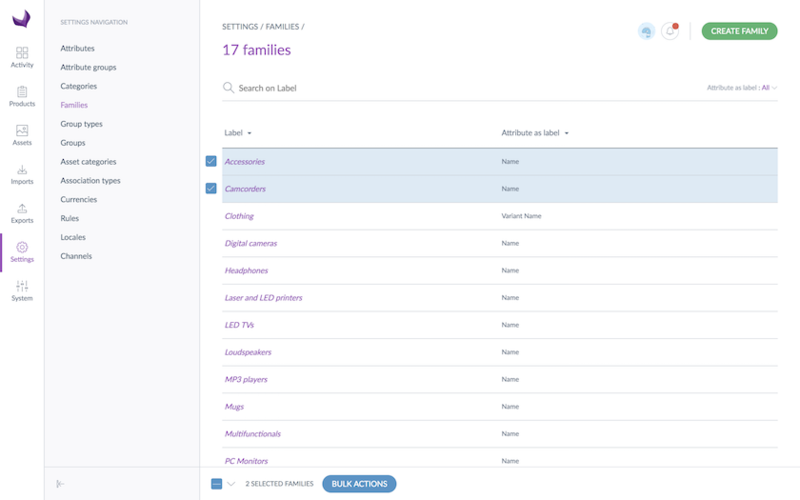 Open and edit the family tab. Deleting a family does not remove the attributes from the PIM and does not delete the products associated to it. 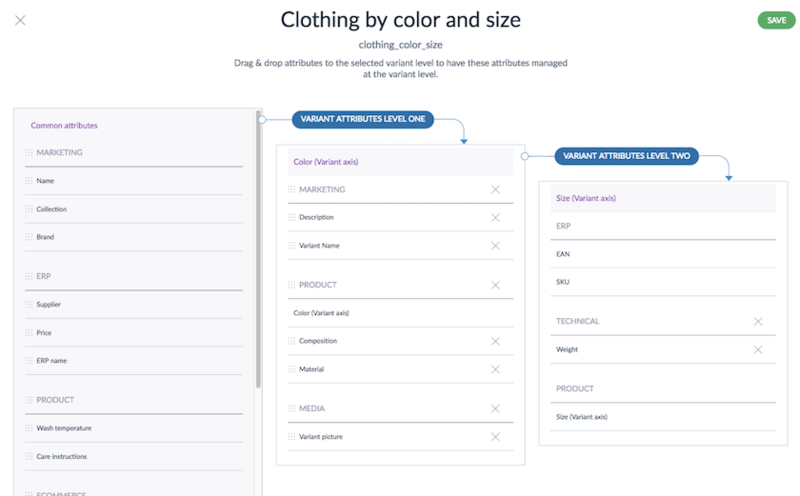 Attributes that had values will remain visible in the product form to keep the product information. These attributes will become “optional”. Products without a family will no longer have a completeness. A family with family variants cannot be deleted. You first need to delete its family variants. A family cannot be deleted if there are some products within this family, you first need to remove the products from this family (refer to the bulk action change family of products). A family used by a published product cannot be deleted. You first need to unpublish your products to delete the family. 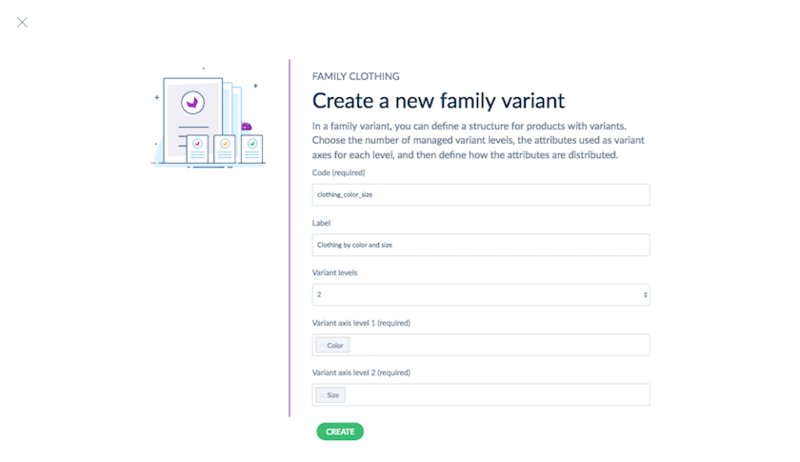 A family variant allows you to define the global structure of your products with variants and will enable you to create product models. 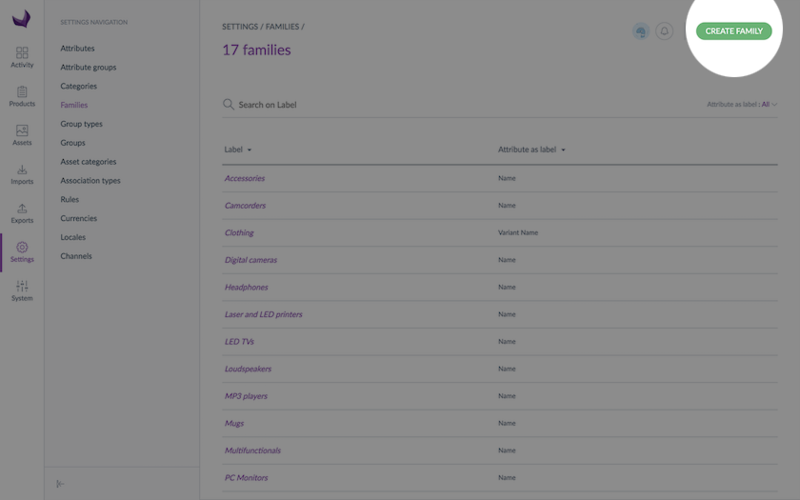 The family variants are managed in a dedicated tab called Variants in Settings/Families. 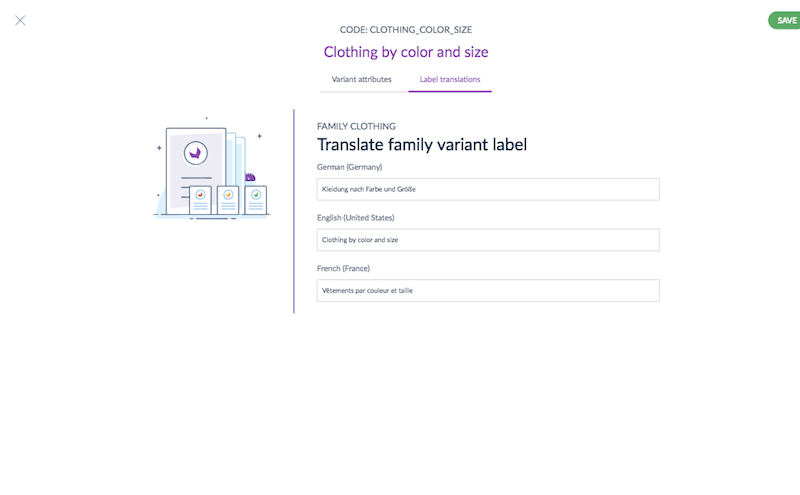 In our clothing example which varies on 2 levels by color and then by size, the common attributes are: the name, the collection, the description, the brand, etc. The attributes that vary by color (variant level 1) are the composition, the pictures and the attributes that differ by color and size (variant level 2) are the EAN, the SKU and the weight. You can create one or more family variants in each family. The variant axes for each level: the variant axes are attributes of the family which identify the variant product in the product model. Their values must differ from a variant product to another in the product model (unicity). For examples, the color and size for a clothing model (there is only one product with the color blue and the size S and one product with the color blue and the size M for a t-shirt model), the color for a chair model, the dimensions for a mattress model. Click on Create, the family variant is created. You cannot use scopable and/or localizable or locale specific attributes as variant axis. A family variant cannot have more than 5 attributes used as a variant axis. 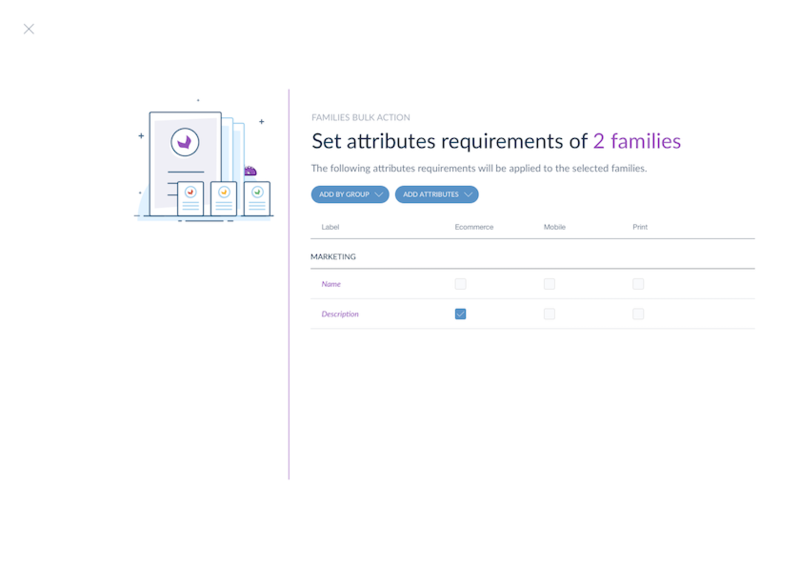 Then, a screen to distribute the attributes between the different levels (common attributes, variant attributes level 1 and variant attributes level 2) for the family variant will be displayed. 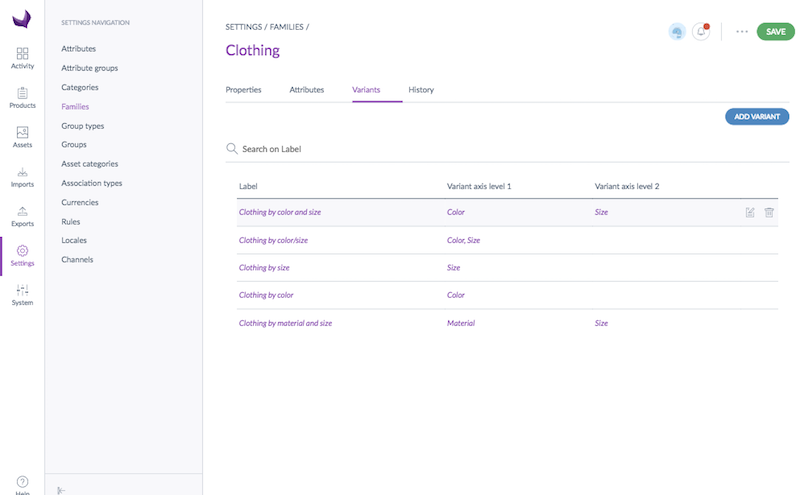 By default, the common attributes are all the attributes of the family, except the variant axes attributes (available for each variant level) and the attributes with the property unique value at Yes which are at the last variant level = product level (for example the SKU and EAN). 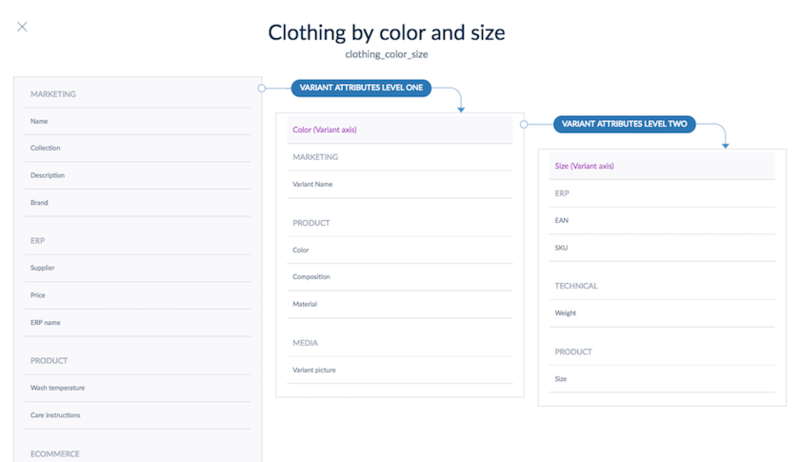 Moving attributes from common attributes to a variant level or from the variant attributes level 1 to the variant attributes level 2 means that the selected attributes will be managed at another level. If these attributes were already filled in, those values will be kept and visible in the new level. 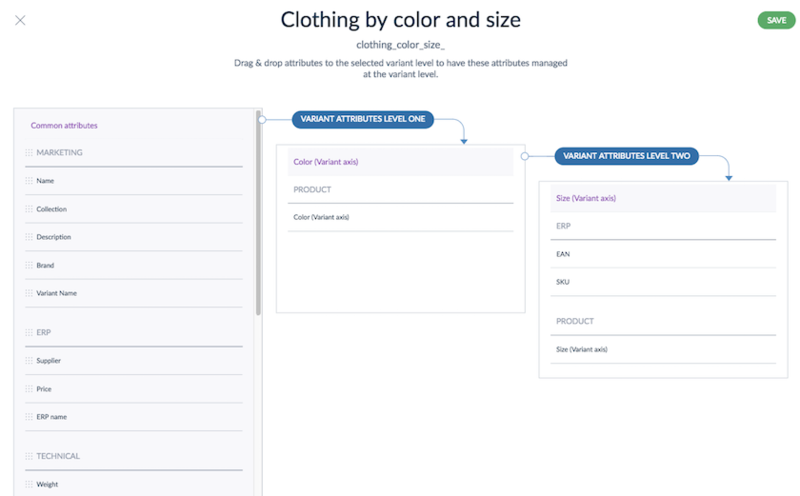 For instance, to keep our Clothing example, if you move the Description attribute from the common attributes to the variant attributes level 1, the description previously filled in will be kept for all variant products, but you will be able to change it at the product variant level 1. Basically, you will have the possibility to fill in a description for each color. You cannot move a variant axis or an attribute with the property unique value at Yes. 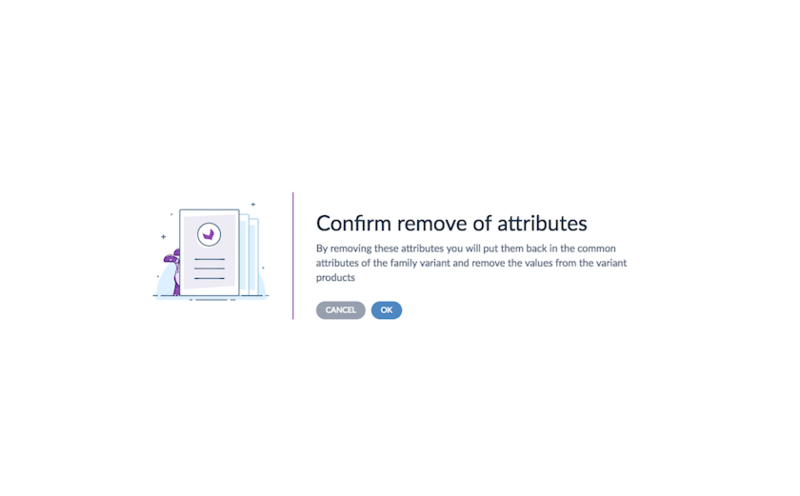 A family variant can be deleted if it does not contain any product model. If it has product models, an error message will be displayed. 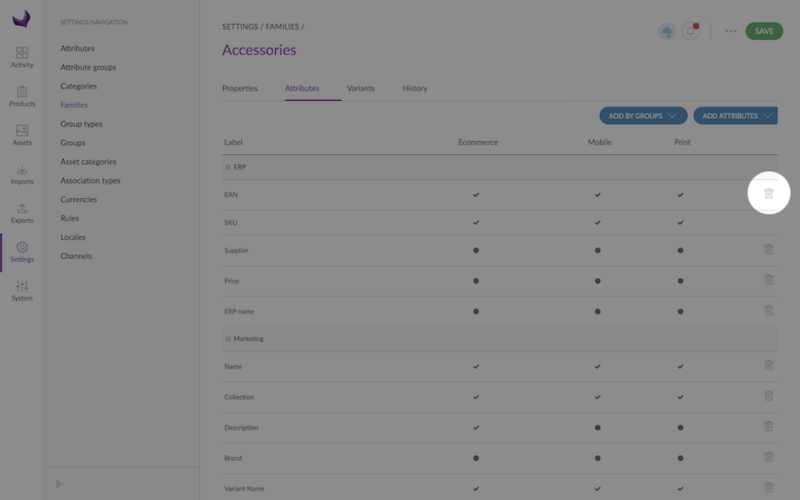 You will have to delete those products to be able to delete your family variant.